The Most Versatile Cutting Tool Ever Made! Cuts through wood, dry wall, plastic, even sheet metal. Saws any shape your hand can follow. Fits any standard electric drill. Made of industrial grade steel coated with titanium nitride to last longer, cut faster, and stay cooler! Break more easily and wear out quickly. Aren’t backed by an unconditional lifetime guarantee! More Materials: The Beaver Sawdrill® cuts through wood, dry wall, plastic, even sheet metal, faster and easier than anything you’ve ever seen before. 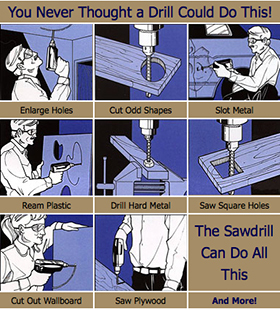 More Shapes: The Beaver Sawdrill® is a side-cutting drillbit that can cut any shape your hand can follow! More Quality: The American-Made Beaver Sawdrill® is manufactured of Precision Ground M2 High Speed Steel, the best steel for a wide variety of materials. The Beaver Sawdrill® is coated with Titanium Nitride, a tough hard coating that lasts up to 6 times longer and cuts faster and cooler. The 135° Split Point ensures fast, easy starting – even in steel. The Beaver Sawdrill®’s 1/4″ diameter bit fits into any standard electric drill. You just chuck it in as you would with any drillbit. But that’s where the similarity ends. The Beaver Sawdrill®’s 135° Split Point drills the starting hole and then 90 sharp teeth go to work sawing any shape cut you want. I just bought “The Original Beaver Sawdrill®.” Wow! This is the best thing I’ve seen in years.I was in a tough situation. After breaking three other drillbits side-drilling on hard metal, I decided to try your “new-fangled gizmo.” Wow! It cut like butter in a few minutes and I couldn’t even tell the drill bit had been used. THANKS and I mean THANKS. I’ll recommend the Beaver Sawdrill® to everyone I know and will pick up more this weekend so I’m never without one. Just used your Beaver Sawdrill® to cut sheet metal in my car for new speakers. It worked great and saved me a lot of time and the cost of a 6 holesaw! Ill recommend your product to all my friends. May I compliment you on a very fine, creative product in your “The Original Beaver Sawdrill®.” As an engineer and do it yourself person, it is the best!